This Egg Spring Rolls was in my drafts for months. 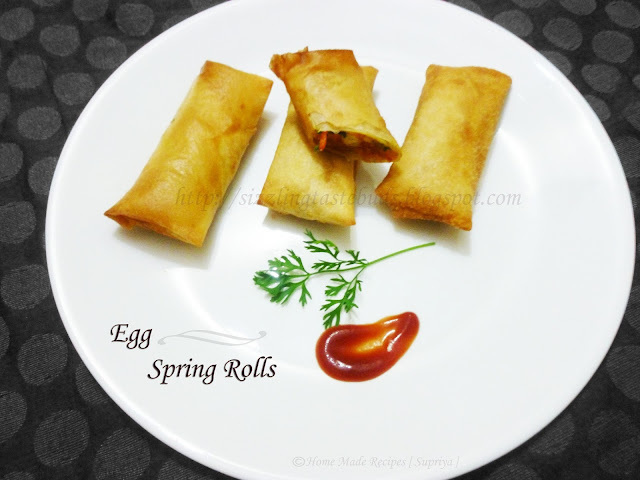 After preparing this Egg Spring Rolls, I had tried on Dil Pasand Recipe with the left over spring roll sheets. 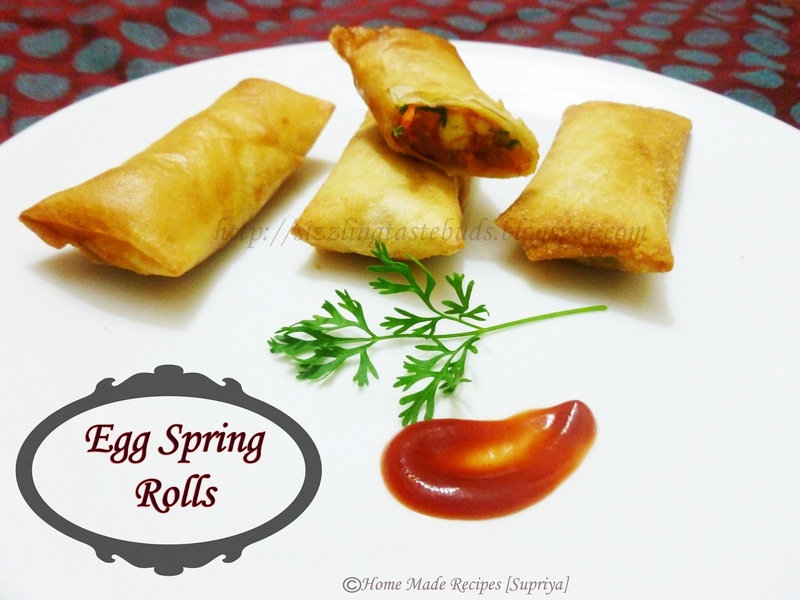 I have already posted it long time and somehow forgot to post Egg Spring Roll recipe. These Egg sping rolls are crunchy and delicious evening snack . Kids will love to take it in their snack box and share it with their friends. I am yet to try this to make it from scratch. I have used readymade store-bought spring roll sheets. It surely saves lot of time. 1. Boil the eggs, remove the shells and chop the eggs into cubes. 2. Heat 2 tsp oil in a wok and add chopped onions. Fry till onions turn slightly brown in color. 3. Add in ginger- garlic paste and saute it for a minute. 4. Add chopped tomatoes and mix well. Simmer the flame and let it cook till tomatoes softens. 5. Now add all the dry ingredients including salt and mix well. 6. Drop in the chopped eggs cubes , turn the flame to high and mix all the ingredients so that the mixture combines well and the water content is reduced. 7. Lastly add fresh coriander leaves and mix. To separate the spring roll sheets, first defrost them to room temperature. Follow the direction as directed in the cover and assemble all together. Deep fry the rolls in hot oil till they turn golden brown in color. You can add any filling to the spring rolls. Stir fried vegebales, grilled chicken or try out with any left overs dry sabzi.